Everyone who owns a computer and/or smartphone should know about Neil Postman. I should’ve done this post yesterday, but after an eventful day in the city and a visit from my uncle who recently moved to Florida I was quite exhausted at the end of the day. Needless to say, I’m making up for it now. What’s On Your Mind? – Write the post that was on your mind when you first started a blog OR draft a post you’ve been holding back. Well, I think I already wrote the former as I broke down my crisis in Post-Grad Psychotherapy. I started blogging a month after graduation and really just needed a place to spill my guts, a place that didn’t have to stay secret in my notebook so people could read and connect with my words. Since then I’ve written about other things, but I still keep a keen eye observing everything and everyone around me, trying to figure out how to live in the world, how to get started, how to make my mark. I wouldn’t say I’ve been “holding back” a post, but I would like to recount and reflect on my first Saves The Day concert. It’s a story I don’t think I’ve fully told before. After downloading these songs, I’d put my iPod on shuffle and wait for one to grab me. (This method worked really great, by the way.) In 2007, I had downloaded a bunch of Saves The Day songs and was listening to my iPod on shuffle when suddenly one of them did grab me. That song was “Anywhere With You“. Little did I know that song was the first track off Saves’ arguably most controversial album, ‘In Reverie‘; Compared to their last three albums IR was awash with a kind of dream-pop feel, chord complexities, multi-part harmonies, and exquisite melody lines previously unheard in their punk/pop-punk/emo releases. Frontman Chris Conley’s voice had changed and his songwriting had reached a new level entirely – and it was the most beautiful thing I had ever heard. From that one song I became ravenous, searching for their albums, making sure no audio file went unturned so I could complete my collection. I became aware of my friends who were listening to them, and I asked a million questions about their fluctuating lineup, voice changes, and their discography in general. Who was this band? When were they touring? Where could I find their guitar tabs so I can play their songs? So in 2008 I found their tour schedule, begged a friend to come with me, begged my parents to go by ourselves, and embarked on my first of many Saves The Day shows. I drove us to the bus stop and we took the bus into Port Authority. We had dinner in Times Square and took a cab to Highline. I still remember the line out the door and the dark, dingy look of the buildings within the Meatpacking District. I would later learn not only was the show a part of a CMJ Showcase, but it was in fact sold out. We shuffled inside as the opening band, Moneen started to play. I remember striking up an awkward conversation with the merch guy. I think I asked him how long he’d been selling merch for or something really weird like that and proceeded to tell him I was thinking about studying the music business in college. He politely conversed with me before I put him out of his misery and bought a Saves The Day shirt and went inside. I remember feeling incredibly young and out of place in a 20-something crowd. Everyone was drinking beer in bottles and I tried to act tough, saying to my friend I’d pay someone to buy me one if I didn’t have the ACTs the next day. Oh yes, I felt like a total badass because I had be up at 8 AM the next day to take a silly standardized test and here I am in the city seeing my favorite band without a care in the world. The crowd started to fill in as Kevin Devine took the stage. This show was a real treat because this was the first time I saw Kevin and he knocked my socks off, not knowning it was the first step in making me a fan for life. I distinctly remember him screaming his lungs out to “Brother’s Blood” and just staring transfixed at his outpouring emotion. All I remember of Saves The Day that night was a happy blur. Just being so excited and in disbelief that there they were right in front of me and Chris was singing right in front of me. Half-aware that the crowd had grown to a sea of people shouting lyrics back and forth as we swayed to the natural ebb and flow of the push and pull, typical of a Saves The Day crowd. I didn’t take any pictures or video but just watched, as I do today. I’d only been a fan for about a year and had only memorized the words to a handful of songs but my eyes were wide just taking in the lights and music. What I do specifically remember is Chris introducing a new song, which I realized later was “Daybreak“, no one knowing that song and album would not be released until about 3 years later due to frequent lineup changes. My friend and I might’ve left a little early to take our bus back. I don’t remember exactly. But it was a wonderful night that I will remember forever. I would not see them again until May 2010 at the Bamboozle Festival 2 years later, miraculously getting into meet and greet line without a pass before I saw their incredible set. What’s so interesting about the whole ACT bit is that the score I ended up getting (24) ended up being two points shy of getting into my first choice school – Drexel University. I was refused acceptance to Drexel because of this sole reason. Ramapo College was my second choice and therefore bumped up to first to my then-dismay. I begrudgingly agreed to go to Ramapo and enroll in their Music Industry and Production programs. A year later, Saves The Day was announced as our fall concert and I somehow managed to be assigned Assistant Stage Manager with a friend of mine. (If you care to read my “fangirl” recollection written a day or two after the show, you may do so here…Don’t judge…) That night, that show, and that day went down in Roe history as I not only got some one-on-one time with the band but also got a birthday shoutout. Thinking life could not possibly get better, I later went on to be awarded a scholarship after writing about Chris Conley and how he was one of my main musical influences and why. A year later, I would play and sing “Here, There And Everywhere” with Chris in the Starland Ballroom parking lot after a show in December, the day before Christmas Eve. Two years after that, I would make a daydream come true by accompanying Chris and playing “The Way His Collar Falls” at a secret show at the Warehouse Motor Club in Middlesex, NJ bringing the B-Side song out of retirement from the usual Saves The Day setlist. One could argue Saves The Day was the reason I got a 24 on my ACTs, the reason why I didn’t get into Drexel. But had I got in, would I be telling you the same story now? That Ramapo show was a springboard that led to so many wonderful things in my life. Saves The Day is the reason I am who I am today. Since 2008, I have seen Saves The Day 14 times and have no plans to stop. Each show is a transcendent experience that I cherish and can be equated with nothing else I know to be of this world. There is a magic that goes on in the crowd and on stage, energy and emotions always at peak levels. Saves The Day has been the soundtrack to my life for 7 years…and I couldn’t have asked for more fitting accompaniment. Author RoePosted on February 22, 2014 March 1, 2014 Categories 30 Day Challenge, Artist/Band ProfilesTags 2008, 30 day challenge, cmj, concert, highline ballroom, kevin devine, moneen, new york, nyc, saves the day, zerotoheroLeave a comment on Day 3: What’s On Your Mind? Day 2: What’s Your Name? Today’s challenge is, What’s Your Name?. The assignment: To edit the title and tagline of my blog and make a text widget summarizing what my blog is all about. Well I didn’t want to change the title. I like “Roe Knows Best” a lot. It just has a nice ring to it. Since I’m kind of floundering about my daily life with my indifferent expectations and unknown future ahead, I guess that’s the kicker – What exactly do I know? The darker part of my psyche says, “Nothing! You know absolutely nothing! What are you doing? Get back into bed and bask in sublime unconsciousness forever”. But another voice, no louder than the whisper of wings, tugs back and replies, “You are figuring it out. This is the beginning of your journey. The longer you keep at it, the more will be revealed to you. All in good time”. And maybe that’s my goal: To eventually have the answers to my many questions, blogging about my experiences and realizations so it becomes knowledge others can utilize when they find themselves in the same boat as me. I like connecting and sharing stories. One of the many joys I get out of performing live is having the few listeners approach me afterwards expressing their exuberance that I sang about something they’ve known too well, something they’ve been going through too! “This is what happened to me. I can’t believe it happened to you too!” Connections. It feels good when that happens. I feel like I’ve successfully contributed to something; I’ve made contact somehow. I did ponder the tagline though: “23-year-old college grad in a constant state of curiosity and (self)discovery”. I feel like I’ve evolved since this past June when I began the blog. Not to say I’m not still in those constant states, but now that I’ve written a few posts I wanted to redefine the scope and rephrase what I’m all about. So I changed it to,”23-year-old college grad surfing the tidal wave of Life”. Now, I don’t surf. Never have. Maybe one day I will, but I cling to that surfing metaphor; I feel its accuracy is profound. Because isn’t that all what it is? Us trying to keep our balance through our respective thrills and terrors, trying not to wipe out and fall off the board? I added the text widget, as you can probably see on your upper right. I may change the words around, but I figured that was the best way I could summarize the blog. Like a piece of dough being flattened by a rolling pin, I am still working myself out and trying to figure what I’m all about. It’s a process, but writing helps me put things into perspective. Author RoePosted on February 20, 2014 February 22, 2014 Categories 30 Day ChallengeTags 30 day challenge, zerotoheroLeave a comment on Day 2: What’s Your Name? 30 day challenges usually don’t sway me, but I think I’ll do this one. It seems fun – and I like writing. The folks over at The Daily Post have created a 30 day challenge to better your blog and perfect your WordPress technique, if you will. It definitely wouldn’t hurt to check it out. Let’s do it together! Today’s challenge is, Introduce Yourself. When I started this blog in June, I created an About page briefly highlighting why I created the blog in the first place. But let’s go more in depth! Who I Am: Rosanna O’Brien a.k.a. “Roe”. Self-nicknamed because of the common mispronunciation of my first name (It is Ro-SAH-nah, not Ro-ZANN-na) and the chosen spelling is not after my fondness for caviar or as a reminder of the famous abortion case, but because after sporting “Ro” for awhile I decided that aesthetically, it looked naked and added the E for good measure. Three letters seem more complete to me than two. Go figure. Why I’m Here: Tumblr got old. Or rather, Tumblr became more about posting memes, pictures, .gifs, and the occasional video. I felt any time I published anything with words it went unnoticed. (Neil Postman would probably have something insightful to say about this were he still alive. The movement of a text-based culture to a pictures/image based culture. Seems as though mankind is reverting in a way, no? i.e. Paleolithic cave dwellers, ancient Egyptians, Native Americans, etc.) Not that I’m getting loads of attention here or anything, but the WordPress community seems to be more encouraging of words and the site is better formatted for active blogging and not the picture spam I was assaulted with via Tumblr (IMO). What I’m About: Many things. I’m a complex woman. To start, I am a songwriter. You can check out my ongoing Twenty-Four Seven project or my soon to be defunct Song Shop project for starters. I also have a Soundcloud, Bandcamp, and YouTube if you care to peep those as well. I don’t like being overbearing in promoting my projects, but I do like it when people are aware of them – even better if they genuinely enjoy them. 🙂 I’m always open to feedback. Why You Should Read My Blog: If you are an unemployed, floundering twenty-something like me this would probably be a great place to bond and help each other through out respective struggles, talk, and discuss things! Aside from sharing my many musings, I squeeze out the occasional poem or write-up about an artist I’m into. I’ve even written a few little articles about something funny that happened to me or something that piqued my interest – That sort of thing. You should most definitely read my blog if you’re into any of those things or just generally enjoy it and want to read it. No obligations, no pressure, no offense taken if you don’t. Why I’m Blogging: Sometimes I have so much to say and don’t know what to do with it. Certain emotions rise up with me and I just need to get things out, whether negative or positive. It’s a way for me to organize my thoughts and keep them in a place I can look back on later. Spoken words can be so fleeting and are gone as soon as you speak. Written word lasts longer. I also think it’s healthy to write on a regular basis. I really wish I minored in Journalism in college because now I realize how much the written word binds everyone together and informs us, whether we realize it or not. Once you know how to write well, so many doors open. This is a way for me to stay on my toes knowing I’ll get better with every post I write. Practice makes better. Topics: Aside from the ones I mentioned above and have already done, I’ve been thinking about doing more music writing. Perhaps even profiling some of the lesser known artists I know via Facebook and giving them a voice and a platform to be heard. It’s just a thought – I haven’ t pursued anything yet. If you have any ideas, please reach out to me! Who I Would Love To Connect With Via My Blog: Anyone who is interested in anything I have to say. I try not to limit myself to write about just one thing so there is definitely variety, but if you’re on my wavelength I’d love to hear your feedback! And again, if you’re a girl or guy in the postgrad rut with millions of existential questions, I’m in the struggle with you. Thus is life sometimes. I’m still trying to make sense of it all. What I Hope To Have Accomplished If I Blog Successfully Throughout 2014: I guess the most I can ask for is to come to a dawning realization about the things I struggle with. Every time I blog or write, I feel like I’m working out the problem – I’m stretching the muscle, if you will. I hope at some point that muscle will become stronger and stronger so I can work out the dissonance I feel towards the world sometimes. And if it’s not too bold to say, I wouldn’t mind writing for a larger site or blog and contributing my efforts there whether it be for music or something else. I think that’d be a lot of fun to do. I hope blogging independently will refine my skill and build my confidence. I’m reading a new book: Women Who Run With The Wolves (see my Book Club page for more info) where author and Jungian analyst Clarissa Pinkola Estés delves into myth, story, dream, and the omnipresence of the wise, Wild Woman archetype that is innate in all women. The book was given to me by a friend from my last job and after ravaging the insights of Campbell, Jung, McKenna, and Postman and eating up the wonderful fiction of Raymond Carver, J.D. Salinger, and George Orwell let’s just say it’s taken me awhile to get to it. I’m enjoying it more than I thought I would. I was afraid I wouldn’t as the Introduction was verbose and a slightly exhausting read but now that I’m getting to the good stuff, my understanding is starting to fall into place. I’m only on the third chapter, but I feel as though I’m being handed a sort of guide for myself as a woman and therefore a guide to life. When reading Joseph Campbell’s The Hero With A Thousand Faces, I felt the ever persistent question popping up in my head: “Does all this also apply to women?” and “What of the Heroine?”. I’m still figuring it out. I like to think The Hero’s Journey applies to women as well, perhaps with a few tweaks and modifications. (For example: perhaps there is a Mother Quest instead of a Father Quest). Not to say Women Who Run With The Wolves is a female reflection of The Hero, but let’s just say it brings more personal illumination to the femininity that resides within and is more informative on how to use that energy through understanding certain stories and myths. The pattern in Ms. Estés’ book appears to be sharing a well-known myth/story and then breaking down its symbolism and characters and how it relates to a woman’s life. She also shares Jung’s strong belief that the unconscious is a separate entity of our psyche that communicates with us the only way it knows how – through dream. In the beginning of the book, Estés parallels the lives, attitudes, and instincts of women and wolves. Both are intuitive, nurturing, intelligent by nature. She tells a story of La Loba – The Wolf Woman, who goes around searching for wolf bones in the desert. She gathers these bones, puts the skeleton together near her campfire, raises her hands and sings a song so that the body, hair, and flesh of the wolf grow back and consequently becomes alive again. The word “wild” Estés says, has been given such a negative connotation over time. But “wild” does not indicate something as bad, evil, or dangerous. It should not instill fear, but rather remind us of nature untouched and preserved, without interference; Life, body, and mind in their original states. So this Wild Woman archetype should not be feared or thought of as some creature or other to be expunged from the psyche but rather embraced and nurtured so that women may reach their fullest potentials and realizations. Last night I dreamt I was in an upstairs area, maneuvering through different towers. But they were all connected somehow. Maybe by bridges or something. There were stairs inside the towers but not many. I only used them to go between the different levels of the individual tower I was in. But going from tower to tower, I have no recollection of how I got there. All I know is that I was. These towers were packed with people. It was actually slightly difficult to navigate. It was understood that these towers were used for academia and the tower I remember being in had an event I wanted to attend. I eventually got to the area (which was already full with people) and hung around for awhile. But once the speaker started speaking, I realized I didn’t want to be there anymore. So I left. Down the stairs and outside. But outside was different. I was surrounded by tall grasses and trees, but mostly grasses. There was a slight breeze that I saw in the sway of the stalks. I remember trying to navigate my way home and being confused by each turn I took. I then realized there were two creatures walking about, but I couldn’t see what they were as they were mostly blocked out by the grass. Then I looked straight ahead and saw I was confronted by a Lioness. When dreaming, I wasn’t sure exactly what it was. It was after I woke and remembered the dream that I realized what it most strongly looked like. I never fully encountered the other creature but I remember it being an orange or dark reddish color, almost the color of a fox but a bigger beast. Maybe a tiger without stripes. 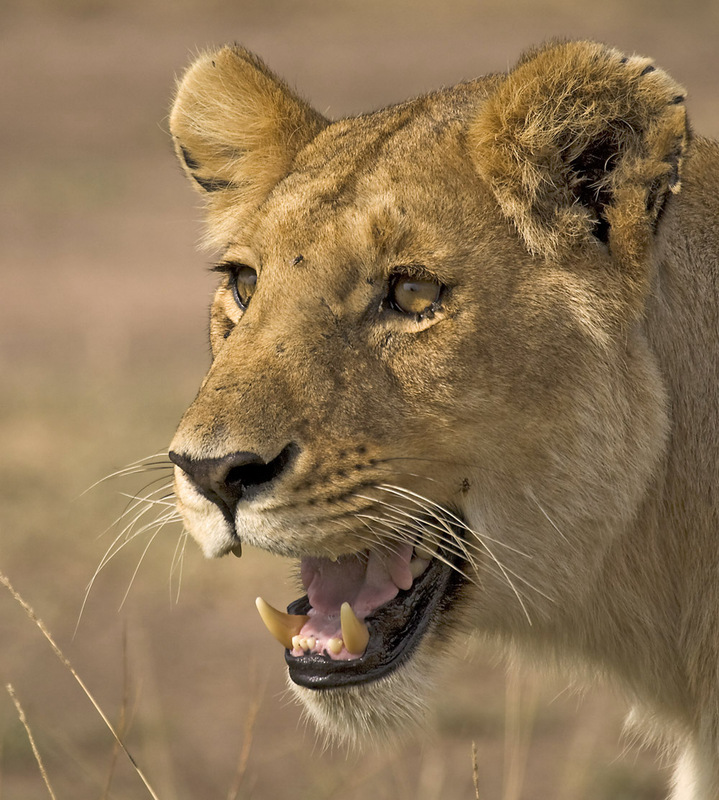 The Lioness neared close and bared her teeth. I suddenly became paralyzed with fear. I wanted to run but knew I shouldn’t because I didn’t want to risk her running after me, scaring her with my sudden movements. I was too rooted to the spot anyway. It was then I realized I had to show her I was peaceful and would not harm her. I had to disassociate myself from her viewing me as a potential threat. I closed my eyes and slowly stretched out my arms to show her I had no weapons, no claws sharpened, no teeth bared and tried my best to slowly breathe. I remember my breaths being shaky as I tried to calm them. I opened my eyes to see she had visibly relaxed. After that, I can’t remember anymore. When I descend the tower (descending is a common Jungian motif for descending into the unconscious) outside it is wilderness – unconquered terrain. And I am scared and unsure. This represents my view of the outside world; I feel as though I know absolutely nothing about it. And the encounter with the Lioness is my encounter with my Wild Woman, my feminine wildness. The Lioness is not just a symbol, but she is a part of me. Perhaps she bares her teeth because she is scolding me for being afraid, like a mother wolf scolds her cub for getting into mischief when teaching him how to hunt; Maybe she’s telling me to toughen up. Maybe this is terrain in my psyche I have not entered before and she does not know if I’m an intruder. Friend or foe? I think my behavior towards her is an accurate depiction of how I am trying to make sense of all this; I do not run, knowing it may hurt more than harm. I am slowly opening my mind and my arms to her, despite my intimidation. I am letting her in and I think my unconscious just wanted to confirm and validate that in the only way it knows how – through dream. *It wasn’t until I was writing and recollecting my dream that I realized I have tapped into another archetype/motif – The Ivory Tower. According to Wikipedia, “From the 19th century…[the Ivory Tower] has been used to designate a world or atmosphere where intellectuals engage in pursuits that are disconnected from the practical concerns of everyday life. As such, it usually carries pejorative connotations of a willful disconnect from the everyday world; esoteric, over-specialized, or even useless research; and academic elitism, if not outright condescension. In American English usage it is also used as shorthand for academia or the university, particularly departments of the humanities”. I am absolutely floored at my findings. I never knew this is what an “ivory tower” meant. The fact that my unconscious already knew the towers were for academic purposes is astounding and to be honest, I am very much in shock. I’m not sure if this finding changes my original interpretation of how I view the towers or how the towers are connected to me…As of right now I think not other that perhaps the towers is how I view academia now; Overpacked, overcrowded, nothing of true interest. Perhaps I now hold a “pejorative” view and that is why I no longer claim allegiance to it. But either way, HOW COOL IS THAT? !